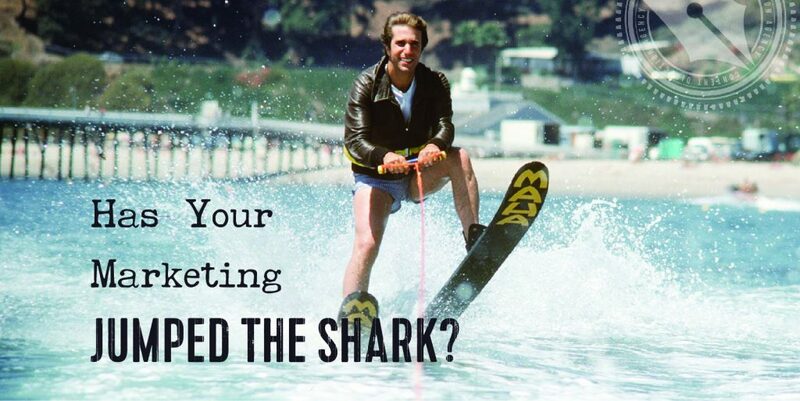 Has Your Marketing Jumped the Shark? I don’t like scary things. But I wanted to finish the show and find out what happened! That’s when I put my screenwriting training to work for me. — so that I could take one earbud out and not jump out of my skin. I still enjoyed the show, but being able to predict what was coming next (even if I didn’t know the exact details) took away a lot of it’s power to manipulate me. Over the last few years, the promise of Internet marketing has swelled and grown to an impressive volume, especially in certain verticals. People started saying — and demonstrating — that there were ways to reach hundreds, even thousands of customers and create “passive” income. A few experts rose to the top in popularity and fame because their formulas worked — let’s be clear about that from the start. They worked not just to sell those experts’ programs, but then to sell the programs of those who bought them — and so on, and so on. To the point that, as students of Internet marketing, we have gotten to the point that we know all the beats. You get an email from someone you’ve subscribed to, proclaiming that their friend or colleague is hosting a free video series / summit / challenge that you should check out. You provide your email address to get access to the free training, and the first video is 20 minutes of an incredible rags-to-riches style story of transformation / an impossibly full summit schedule that you couldn’t possibly attend 8 hours a day / a simple (and sometimes incomplete) series of baby steps in the challenge that don’t actually solve your problem. Of course we can predict what comes next in the sequence, because we’re business owners, students of Internet marketing. It’s in our best interest to study the mechanics of their sales process so that we can put the useful bits to work for us, right? But we’re not the only ones paying attention. As I said, bingeing on a show reveals some of the moving parts. If you watch enough Friends, for instance, you’ll see that almost every episode is made up of one group of friends with the “A” plot problem, and the other couple of friends dealing with a “B” plot problem. In a TV crime drama, the episode usually opens with a crime, the detective investigates, there’s a red herring, a plot twist, and then they catch the criminal before the final credits. We know what to expect. In the same way, our customers and clients (especially if you’re in certain niches) have been bingeing on our marketing tactics for a couple of years now. And they’ve got to where they can predict the beats almost as expertly as we can. When people talk about a TV show “jumping the shark” they’re referring to a particularly memorable episode of Happy Days when the Fonz literally jumped over a shark on a pair of waterskis. It’s the point at which the plot of a TV show gets a little ridiculous in trying to keep the audience coming back. But instead of exciting people, the audience rolls its eyes and gets wise to the idea that their formerly favorite show is getting a little desperate. The same thing happens when a marketing effort starts to jump the shark. But our audiences are getting savvier. They’ve seen these stories before. They know the beats, even if they don’t know the exact script. And they’re not as likely to part with their money as they used to be. I’ve seen many successful entrepreneurs in my personal circles who have suffered this year. Sales are down. Ad costs up. Conversion rates tanking. The things that they used to be able to count on are no longer so rock solid as they once seemed. And so some marketers are trying to jump the shark. They’re dressing up the same old formulas in new costumes. Trying stunts (like waterskiing over a shark) to get attention. But never actually changing up the underlying approach. In my opinion, the problem here is that we’ve relied too heavily on someone else’s formulas, someone else’s script. Sure, we fill in our own personal details, the story changes a little from launch to launch, but the bones remain the same. Because we’re all shooting from the same script, the impact is greatly diminished. But what if we rewrote the script? Each of us. Personally. I know what you’re thinking: I’m not a marketing or sales expert. Who am I to try to do my own thing, carve my own path, when these people have got it all figured out? But here’s the thing: You are the expert on your people, your product, your results. You know best what they need to hear, and how they need to hear it. You know if they need to see you in a video, or if they need testimonials and case studies, if they need to be appealed to emotionally or with cold hard facts. If you know your customers well enough to serve them, you know them well enough to market to them. The formulas and scripts we’ve all relied too heavily on are losing their potency. But those formulas were once just one marketer’s ideas about how to serve their people. You can (and should) come up with your own formula, your own script to market and sell the way you want to talk to your audience. It’s time to step away from the formulas and write your own script. I can’t agree with you more! I’m so fed up of the 3-video series where you get their life story but no actionable advice. Sure, they tell you what you’ve going to learn in each video…but then never deliver the goods. That was why I bought from you after one of your webinars because there was so much actual content in the webinar, I wanted to learn MORE from you. Spot on. I’m the first to unsubscribe when I sense that the person / business things I’m gullible or if I feel their sales tactic jumping out at me. And the endless scrolling to the bottom of a long-winded page to see the pricing is also a no-win approach (although I guess it must work for some). Great article – also raises the bar for marketers to try something different. Has got me thinking as usual from your insights!Hmmm…:) Thank you! Best article on marketing I’ve read in 2017. I love the analogy between bingeing TV shows and sales techniques fatigue.